LIVERMORE, Calif. — The longstanding mystery of soot formation, which combustion scientists have been trying to explain for decades, appears to be finally solved, thanks to research led by Sandia National Laboratories. Sandia National Laboratories researchers Paul Schrader, left, Hope Michelsen, center, and Olof Johansson cracked the code to soot formation. (Photo by Brent Haglund) Click on the thumbnail for a high-resolution image. “The work represents an enormous scientific success as a result of years of support for focused, systematic work on developing a fundamental understanding of high-temperature hydrocarbon chemistry,” said Michelsen. 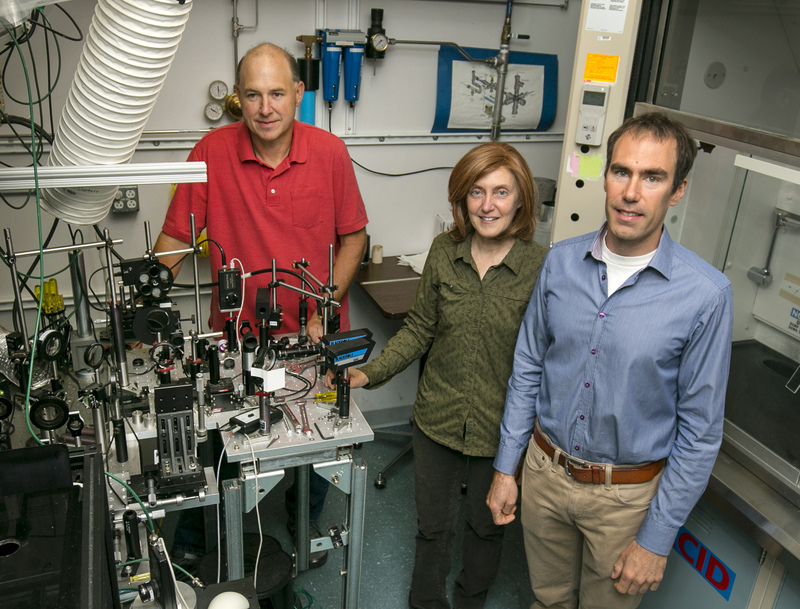 Sandia National Laboratories scientists have discovered a mechanism for soot formation, solving a longstanding scientific mystery. In this image of a candle flame, the colors are from hot soot luminescence. The mass spectrum at the bottom shows the peaks for the radicals that drive reaction. The incipient soot particle shown between the two arrows is the cluster that marks a transition to the condensed phase. 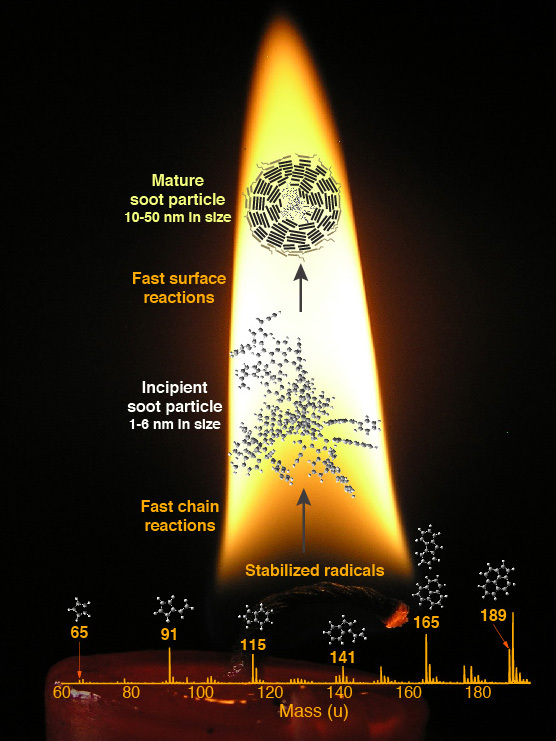 Fast reactions grow the particle shown at the top of the flame. (nm = nanometer = 10-9 meters) (Image courtesy of Hope Michelsen). Click on the thumbnail for a high-resolution image. Soot is formed during the combustion of hydrocarbon fuels, such as oil, natural gas and wood. Although it has detrimental health and environmental effects, soot is extremely important to many industrial processes, such as boiler performance, glass production and carbon-black generation for rubber-product reinforcement and pigments. In its final form, soot is a solid very similar to graphite, but it is initially formed from gaseous hydrocarbons. Experimental evidence indicates that it transitions from a gas to a liquid before it becomes a solid. Scientists have been trying for decades to explain that transition. “Most people are familiar with how the gas phase of water — water vapor — condenses into droplets when it cools. Cooling it further will turn it into ice, the solid phase of water. Soot is different,” said Michelsen. Soot particles are formed when gaseous molecules are heated to high temperatures, and they don’t easily turn back to gaseous molecules the way water droplets do when they are heated up. Strong chemical bonds hold soot particles together. “Making soot is more like baking a cake than it is like condensing water. Heating liquid cake batter to high temperatures turns it into a stable solid form,” explained Michelsen. The key to soot formation, it turns out, is resonance-stabilized radicals, said Johansson. In general, molecules that are radicals have unpaired electrons that they want to share, which makes them reactive. But, unlike most radicals, these resonance-stabilized radicals have unpaired electrons that participate in other bonds in the molecule. Sharing electron density between the unpaired electrons and other bonds in the molecule makes these radicals more stable than other radicals, but, nevertheless, they are more reactive than most of the other large molecules that form soot. Measurements conducted at the Advanced Light Source, a DOE Office of Science user facility at the Lawrence Berkeley Lab, showed a sequence of these radical species in all the flames studied. Michelsen said other researchers had seen these radicals and thought they might be involved in soot formation, but there didn’t seem to be enough of them to be the main driver. “We figured out that these radicals can start a chain reaction,” said Michelsen.